If the world had an eighth wonder, it would be the city of Dubai. The sprawling metropolis is the crown jewel of the Middle East and worldwide. The city is recognized as an epitome of modernity itself, a testament to a marriage between utter opulence and cutting-edge technology. Dubai is the largest city in the United Arab Emirates, and modern Dubai refuses to settle for anything less than extravagant. This very reputation ushers in tourists of all kinds, making it a certified hot spot for the rich, famous and curious. Dubai towers on the Persian Gulf coast, sharing a border with Abu Dhabi to the south, Sharjah to the northeast, and the Sultanate of Oman to its southeast. The city thrives in the Arabian Desert, a rich oasis in the midst of sand dunes that pad the city outskirts. The Western Hajar Mountains present a stoic, impenetrable border for Dubai, the highest in the region, daring only the best hikers and trekkers to climb them. Dubai struck fortune with the oil era, discovered not too long ago in 1966. With the newfound revenue, the city poured the riches into itself, cementing Dubai’s place in the world as a luxurious dreamland. Dubai’s obsession with modernity is made evident in the skyscraping buildings that line its cityscape. Burj Khalifa is the world’s tallest manmade structure, and you won’t require directions in finding it. Burj Al Arab, colloquially dubbed “the world’s only seven-star hotel” is an iconic sail-shaped design and one of Dubai’s most recognizable architectural masterpieces. Dine inside for a breathtaking view of Dubai above the Persian Gulf. The city is a tribute to man’s greatest tool: his mind. 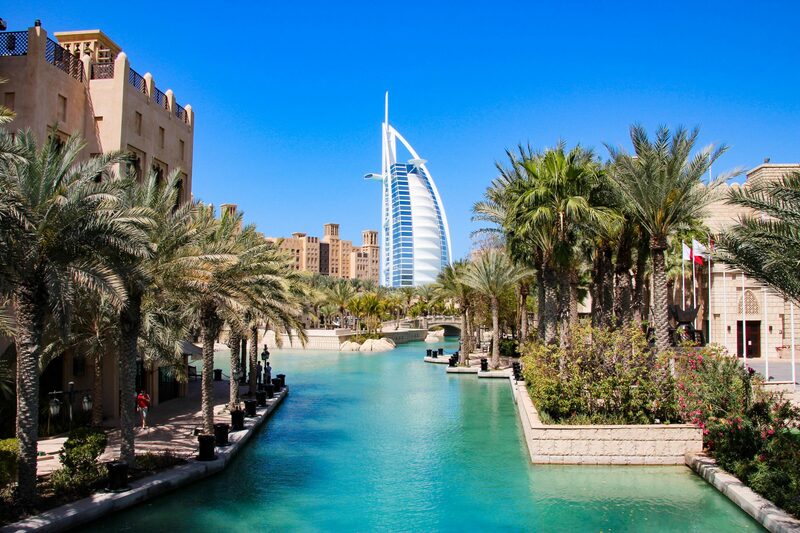 This is made evident not only in its sheer luxury that its buildings, streets, malls, and establishments tout, but in the fact that Dubai has several man-made islands. It’s a yacht enthusiasts dream. Visit Palm Jumeirah, literally created in the shape of a native palm tree—because Dubai can—and will. You’ll find luxury resorts equipped with the equally extravagant shopping and dining venues like Nakheel Mall, Taj Exotica Resort & Spa, Club Vista Mare, and the Golden Mile Galleria. When Dubai creates something, it does not disappoint. Despite Dubai focus on its future, the city hasn’t forgotten its past. The historic area, known as Bur Dubai, features renovated historic buildings, museums. The Grand Mosque sits in the historic district, its architectural design an impressive tribute to Arabian traditions. The Mosque is also home to the city’s tallest minaret tower. The Iranian Mosque, with its tiles as blue as the Persian sea, also resides quietly in the district, its intricate exterior and interior designs so striking, you won’t want to pull away. Al Bastakiya is Dubai’s historic neighborhood, east of Al Fahidi Fort. Courtyard housing with wind towers still stand, a salute to Dubai’s past. Shindagha to the northwest is once where the rule of Dubai resided, its construction part traditional, part renovated as a public museum. Pomp and circumstance surround the Dubai Miracle Garden, which debuted appropriately on Valentine’s Day of 2013. Again, Dubai seeks out to impress, and quickly achieves it with 50 million flowers and 250 million plants, making it the largest natural flower garden in the world. To Dubai, if it’s worth doing, it’s worth over-doing, and the result is nothing short of fantastic. Rich spices like curry and cumin are expertly put on meats in Dubai. Fish, lamb, goats offer tender cuts, doused in a mixture of earthy spices native to the land. Rice pads the juicy, flavorful meats in dishes like Al Machboos. Seasoned and marinated meats can be tried in Shawarma, wrapped neatly in laffa or pita bread, drizzled with tahini or amba mango sauce. Al Harees proves that simple dishes should not be underestimated. Made of meat and wheat, the dish is cooked for hours with a pinch of salt, as the boil and clay pot with coal brings the best out of the three ingredients. Together, the minimal ingredients sing, satisfying a need from every corner of the palate. Getting around Dubai is simple, as the city has multiple transportation options for ease of access to its many features. There’s the tram, the high speed rail, waterways, metro rail, and buses. With Dubai’s busy event calendar, you’ll need to buzz around the city so you won’t miss anything. The city is known for its entertainment, its Dubai Food Festival in early spring, and it’s Dubai Shopping Festival. During the day, the Dubai Mall—the largest mall in the world—hosts locals and visitors with glitzy boutiques, stores, an ice rink, a theater, and even an aquarium. Dubai Gold Souk, marked by a wooden arch, is a bazaar that dazzles and thrills with gold, platinum, diamond, and silver. Next door is the Dubai Fish and Vegetable Market, for fresh seafood catches and vibrant displays of bright produce. For chartering and beyond, there’s the Dubai Marina. Treat yourself to al fresco dining on crisp white beaches, The Beach at Jumeirah Beach Residence, where there’s always something to eat, see, and do, and The Walk, lit by Dubai’s iconic, statuesque skyscrapers at night. Dubai wholeheartedly believes in perfection, so much so, it created it out of nothing. The city, built in the middle of a desert, equipped with man-made islands, exists because Dubai simply wanted to be. Driven by its desire to be the best of the best, it’s more than a luxury tourist attraction. And with your luxury yacht charter. you’ll quickly see that. The city is the manifestation of the inherent impulse in all of us, the one that says if you can dream it, you can do it. Dubai has certainly done it.